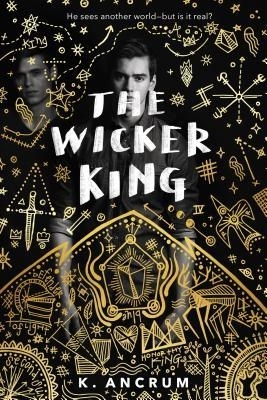 The Wicker King is a psychological young adult thriller that follows two friends struggling as one spirals into madness. Jack once saved August's life…now can August save him? August is a misfit with a pyro streak and Jack is a golden boy on the varsity rugby team―but their intense friendship goes way back. Jack begins to see increasingly vivid hallucinations that take the form of an elaborate fantasy kingdom creeping into the edges of the real world. With their parents’ unreliable behavior, August decides to help Jack the way he always has―on his own. He accepts the visions as reality, even when Jack leads them on a quest to fulfill a dark prophecy. August and Jack alienate everyone around them as they struggle with their sanity, free falling into the surreal fantasy world that feels made for them. In the end, each one must choose his own truth. Written in vivid micro-fiction with a stream-of-consciousness feel and multimedia elements, K. Ancrum's The Wicker King touches on themes of mental health and explores a codependent relationship fraught with tension, madness and love. K. Ancrum’s debut novel, The Wicker King, offers a glimpse into the unraveling of the human psyche. August Bateman and Jack Rossi have always been friends. Their mythology reaches from the shadows of the past into the present narrative of the novel, affecting every moment that comes to pass. While the chapter structure is clipped, the style lends to tension and an anxious energy which hovers over the reader in much the same way it does the characters of the book. And through it all, remains Kayla Ancrum’s lyricism, which is equal parts spellbinding and haunting. This poetic style of writing lends itself well to the notions of magic and fantasy that fill the dark nature of this novel. But Ancrum’s story is not damsels in distress or happily ever afters, but rather filled with brambles and dead birds eating living flesh, champions and kings and more secrets hidden beyond the wild wood of Jack Rossi’s mind. In this formidable fantasy, August is ready to follow Jack, even if he can’t see anything himself. What emerges from their adventure is both horrific and heartbreaking, testing the bonds of friendship and exposing the toxicity of August and Jack’s codependent relationship. Even as these friends do things they shouldn’t, it is clear they have little in the way of resources or choices, and so they choose to go to the edge of insanity in order to bring Jack back into reality. And readers are forced to follow them into the darkness; quite literally as the pages turn from white to gray to black. The book’s design lends itself to August and Jack’s descent into darkness, serving as a tangible reinforcement into the ways we fail and fall as humans. Between poems written on walls resembling the nonsensical writing of Lewis Carroll in his “Jabberwocky” poem to prose written in poignant and heartbreaking ways, Kayla Ancrum’s debut is one that haunts long after the last page. What’s left is not a simple coming out story, but rather a story about people trying to find their way around the limitations of love and loss and human resilience.